No one knows how much debris makes up the Great Pacific Garbage Patch. The North Pacific Subtropical Gyre is too large for scientists to trawl. From the ice-covered Arctic to the tropical waters of the Pacific, all of Earth’s oceans share one thing in common: plastic pollution. Discarded plastic bags, cups, and bottles make their way into the sea. Today, it seems that no part of the ocean is safe from plastic trash. The global production of plastics has increased from 1.5 million tonnes in 1950 to 299 million tonnes in 2013, representing a four percent increase over 2012. Their use has increased 20-fold in the past half-century and is expected to double again in the next 20 years. Today nearly everyone everywhere every day comes into contact with plastics – especially plastic packaging. For those of us working in the sustainable materials management space, we’ve understood for a long time that plastic pollution in the world’s oceans has been catastrophic. A part of plastics waste reaches the ocean through different pathways, and pollutes the marine environment due to waste mismanagement and coastal and marine activities. Plastic that is dumped in rivers and then ends up in the world’s oceans is one of the major sources of marine pollution, whereas Asian waterways are the major carriers. According to researchers at The Ocean Cleanup, a Dutch foundation, rivers carry an estimated 1.15-2.41 million tonnes of plastic into the sea every year, an amount that needs between 48,000 to over 100,000 dump trucks to carry it away. The Yangtze, the world’s third-longest river, “is the largest contributing catchment” dumping some 330,000 tonnes of plastic into the East China Sea, which is followed by the Ganges River. In a study published in Science journal, around 192 countries whose coastlines are bordered by the Atlantic, Pacific and Indian Oceans, Mediterranean and Black Seas, produced a total of 2.5 billion metric tons of solid waste. Of that, 275 million metric tons was plastic, and an estimated 8 million metric tons of mismanaged plastic waste entered the ocean in 2010. Plastics in the marine environment are of increasing concern because of their persistence and effects on oceans, wildlife, and especially on humans. Several broad classes of plastics are used in packaging: Polyethyelene (PE), Polypropylene (PP), Polystyrene (PS), Polyethylene terephthalate (PET) and Polyvinyl chloride (PVC). A recent significant finding is that minute fragments of plastic debris, termed microplastics, occur in oceans worldwide. Microplastics, a form of manmade litter, have been accumulating in the oceans at least for the last four decades. Microplastics pollution is evidently a major concern when talking about environmental protection in light of human development. Microplastics are particles less than five mm in size that deteriorate from larger plastic pieces that have entered the oceans. Microplastics come from a variety of sources, including from larger plastic debris that degrades into smaller and smaller pieces. In addition, microbeads, a type of microplastic, are very tiny pieces of manufactured polyethylene plastic that are added as exfoliants to health and beauty products, such as some cleansers and toothpastes. These tiny particles easily pass through water filtration systems and end up in the ocean, posing a potential threat to aquatic life. According to a 2012 survey, 4,360 tons of microbeads were used throughout all European Union countries in that year alone. In the light of growing apprehension regarding ocean pollution, and considering the broad range of products from which this pollution originates, it is no surprise that tiny plastic particles can accumulate to such quantities as 93-236 thousand tons floating in the oceans as predicted by a recent study in Environmental Research Letters. It is concerning, however, that this amount is 37 times greater than previous estimates because it speaks to just how much more abundant these personal care products are becoming, and how much of an impact they can realistically have on marine wildlife. Owing to their small size, microplastics are considered bio-available to organisms throughout the food-web. Their composition and relatively large surface area make them prone to adhering to waterborne organic pollutants (e.g. POPs) and to leaching of plasticisers that are considered toxic. POPs, the hazardous human-made chemical that occurs universally in sea water at very low concentrations, are picked up by microplastics via partitioning and the hydrophobicity of POPs facilitate their concentration in the microplastic litter. Further, plastics contain additives and chemicals that are added to improve the desirable properties of the plastic product, for example, antioxidants, light-stabilisers, slip additives, etc which may leach out under conditions of use and accumulate in the environment and gradually end up intruding into the food web. Ingestion of microplastics may therefore be introducing toxins to the base of the food chain, from where there are potential possibilities of bioaccumulation. Microplastics can be consumed by a diverse array of marine organisms, across trophic levels, including zooplankton, bivalves, barnacles, fish, turtles and birds. Over 220 different species have been found to consume microplastic debris in nature. In our preliminary study, microplastics were found in the beaches of Mumbai, Goa and Chennai in a moderate level. Research in this arena has taken a huge leap recently; but unfortunately in the Indian scene, only few reports are available. It is expected that Indian coastal regions are also affected by microplastics. 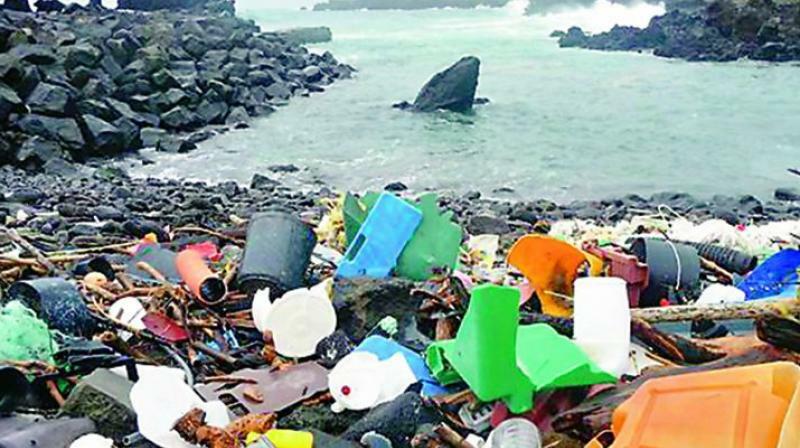 Hence National Institute of Oceanography has initiated joint collaborative study with Japan and Netherlands to bring out more information about plastic pollution status in Indian coastal zone. Recently, the Union Ministry of State for Environment, Forest and Climate Change revealed that 15,000 tonnes of plastic waste is generated every day, out of which 9,000 tonnes is collected and processed, but 6,000 tonnes of plastic waste is not being collected. It is high time we understand that plastic, including biodegradable plastic, not only takes years to decompose in our environment but rarely fully disappears. No matter how inconvenient the truth, it is important that as citizens we take action and change our consumption patterns in favour of alternatives to plastics so that we can minimise our exposure to harmful additives and also help our environment. So the best thing we can do to protect our waterways is try to keep as much plastic as possible out of the waste stream in the first place. For reducing the generation of more plastics waste we have to take the 4 Rs pledge- Refuse, Reduce, Reuse and Recycle. 1) Refuse disposable plastic whenever and wherever possible. 2) Reduce our plastic footprint. 3) Reuse durable, non-toxic straws, utensils, to-go containers, bottles, bags, and other everyday items. And finally 4) Recycle what we can’t refuse, reduce or reuse.